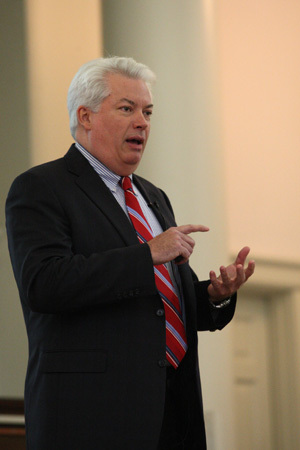 Walgreens executive Dan Luce (left) urged Samford University pharmacy students to view "accountable care" as a requirement of their profession. They should cultivate a sense of feeling "responsible for the outcome" of their customers, he said. An example of accountable care means a pharmacist should feel responsible not only for filling the prescription, but "for making sure the patient takes his medicine correctly," Luce said. Luce, national director of pharmacy affairs for Walgreens, spoke to about 300 pharmacy students and others in Reid Chapel Feb. 8 as the pharmacy school's annual Spring Speaker. Luce said Walgreens espouses a philosophy of "letting pharmacists be pharmacists again." To accomplish that goal, the company has redesigned its stores to place the pharmacists out front, rather than in the traditional back-of-store configuration. "The pharmacist is available to meet with and counsel the patient," he said. The focus is on patient care, freeing the pharmacist from the 37 percent of traditional pharmacy activity that technicians and others can handle. Walgreens has completed the redesign of 400 of its 8,000 stores nationally. Its new store on Birmingham's Clairmont Avenue is an example. Luce also urged the students to become active in professional pharmacy organizations, saying, "The world is run by those who show up."